With an All-In-One on-hire software designed for the Australian labour hire industry. EntireHR empowers you with all the data in one place, allowing strategic staffing decisions to be made in real time. Double your monthly shift bookings by automating time-wasting processes and replacing them with revenue driving activities. EntireHR will empower your workers, your clients and your internal staff to be more efficient and easier to manage with our internationally patented software. Instantly match and contact up to 1000 perfectly qualified candidates at the click of a one button with patented technology not available elsewhere. Data entry is performed by the end user leading to a 70% reduction in time wasting activities for internal staff. This means a massive boost to your bottom line. Fully digital timesheets along with paperless documents all stored in the cloud and automated expiry tracking solves a huge compliance headache for the industry. With simple user-friendly apps for your workers and clients syncing with a customisational interface for your internal staff everyone will love working with you because of how easy it is for each user type. The system has reduced my working week days from 5 to 2! It's absolutely amazing, 99% perfect! How does EntireHR help me grow? Every labour hire business has two sets of customers, your working staff (your stock) and your booking clients. Effectively balancing these two groups and reducing the admin friction (internal staff and paperwork) is the biggest drivers to doubling your business. See everything and anything from anywhere. Simple, client friendly portals and apps boost your productivity and clients select their favourite staff themselves! 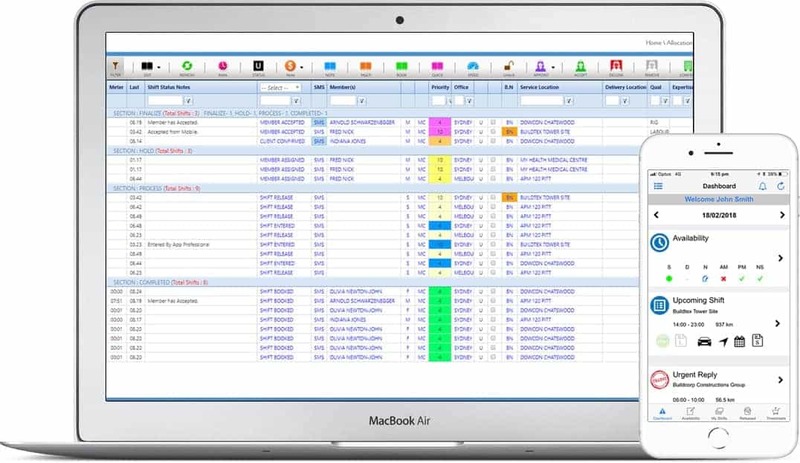 Complete and total control of scheduling, smart functions for “quick fills” and advanced tools for complicated requests. Paperless compliance with auto-expiry date and document management, easily customised with your own settings . Automatic shift splitting protocols and pay/invoicing rates per industry means less manual changes and mistakes. The only CRM designed for the Labour-hire Australian market with agency specific dashboards and apps for managers. Publish advertising for permanent or casual positions directly from your internal system and track candidates. By logging all contacts and shift interactions with user-customistable KPI’s staff are motivated to perform.
" My entire business was spread across 6 different software systems, it was so frustrating and I couldn't see what was happening in my business. That's why EntireHR was born why it's been so successful." George owns and manages of several restaurants around the city. 2 of his normal staff are offhave just texted him in sick. It's too noisey for him to call his normal labour hire staffing group, so he whips out the app and within seconds he places several live requests for ASAP and experienced bartender staff. George can see the live status of his request, and update or cancel it at any time up until someone accepts the booking. Meanwhile Grace is working at the allocations office for the Agency that provides staff to George. Grace is on the phone with a customer, and is too busy to work on these jobs right now. Instead she releases the jobs to the internal online job board. She can focus on her phone call and rest easy because she knows only correctly qualified staff who are available will be able to accept the job. This makes Grace very happy. Now out for coffee we have Sarah, Andy, James and Mary. They are all qualified bartenders who often hang out in their time off. They are laughing because they all have the same app - and each one of them has been notified of the open bartender shifts. Sarah and Mary have the last laugh though, because they were the quickest to accept the 2 open jobs and now have work tonight. That's ok though, because Andy and James will automatically go back into the available candidate pool for the next open job. After working the night shift last night, we see Mary again, on her way home after digitally checking-in and checking-out of the restaurant that requested her. She's happily talking to her friend about how great her shift was, as she worked overtime and performed some extra special duties that mean she will get paid a little extra for the job. Because it's simple for her to accurately log these to her timesheet, she doesn't have to stress about emailing or chasing up a timesheet with no paper trail of the extra duties she performed. This timesheet will be sent either directly to the client for approval or to the agency to process. The best part is all pay rates are applied automatically based on the agencys pre set options, and the agency will automatically alerted to the changes in her shift conditions and if they match the special rules allocated against that client. Finally we see Steve the CEO of the large staffing agency, returning from another successful business trip. Steve's a man in control, and doesn't have time to check in on individual staff members like Grace. Since he rolled 6 different softwares into one with EntireHR. Steve can now see the important figures that matter to his top level of business. Using this data he can make decisions on where to market his recruitment, who his best staff, agents and clients are and where demand is increasing for his business. Steve is dominating with EntireHR and loving his business again. I don’t know how we would have managed the workload in our busy Term 3 if we were still using the old database. EntireHR really has helped us so much in terms of the amount of shifts we are able to finalise, and in such a quicker timeframe.